I felt sorry for it, So I bought it for myself. Action Rhyme: How Many Valentines? We made love bugs today! They are so cute and easy to prepare and the kids love them. I pre-cut the hearts and face pieces. I handed out glue sticks, crayons, and sticky-back foam shapes. They glued it together, drew the line down the center for the wings and added the foam shapes. I had sticky-back googly eyes that I also handed out. I just love sticky-back craft products for our storytime crafts. It’s so much easier than trying to glue everything into place. 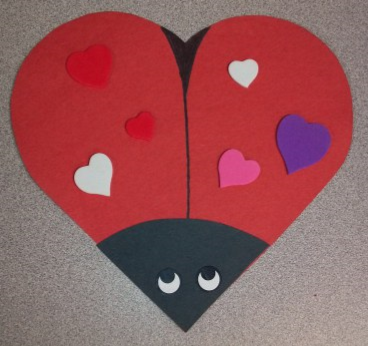 I made sure to do the rhyme “The Love Bug” right before this craft to tie it together. The idea for this craft came from sunflowerstorytime. You can also find the template for this craft there. Valentines Day is on Saturday, so this was a great theme. We talked a little about Valentines Day at the beginning and about saying “I Love You” to others. A couple kids were extra wiggly today, but otherwise it went great! The favorite books of the day were Love Monster and Froggy’s First Kiss. All the books were good ones, though. And, of course, the craft! They loved the craft…and it was easy. I made sure to tell them that they could give this as a Valentine to someone special on Valentines Day.